In less than three weeks time, I’ll be leading my next walk with the group. This local outing was an effort to ‘reccy’ and finalise the route I had plotted and proposed for the occasion. I was actually leading another walk the very next day and you’ll be able to read my account of that experience, soon. This entry was posted in North Somerset and tagged Butcombe, footpath, hiking, Lye Cross, Lye Hole, mudbath, North Somerset, Outdoor Bloggers, outdoors, pre walking, public right of way, Redghill, route planning, Somerset, Two Rivers Way, walk leading, Walking, waterfall, Wrington on 20/03/2018 by Olly Parry-Jones. This was a ‘Joint Walk’ led by Brunel Walking Group, where both age groups were welcome to attend. I’d been to the Brecon Beacons a few times and had always covered the same range of heights (Corn Du, Pen Y Fan, Cribyn…). But this walk promised to offer something slightly different and less frequented by the flip-flop wearing Storey Arms tourists. 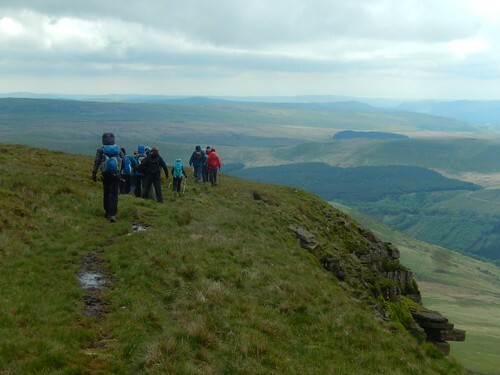 This entry was posted in Wales and tagged aircraft wreckage, Beacons Way, Blaen Y Glyn, Brecon Beacons, Brunel Walking Group, cairn, Carn Pica, Central Beacons, crash site, Fan Y Big, South Wales, The Ramblers, Wales, walking group, waterfall, Waun Rydd, wellington bomber on 22/07/2017 by Olly Parry-Jones.